Makeup meltdown and UV exposure have met their match! 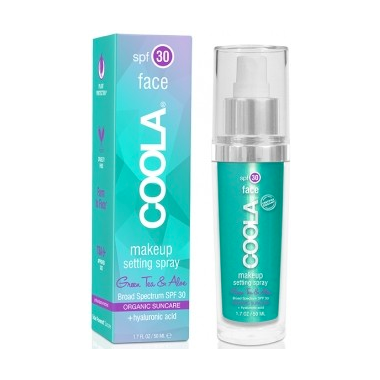 Introducing the first ever SPF 30 Makeup Setting Spray. A simple spritz of this weightless, matte finish mist protects the sensitive skin of your face while keeping your makeup looking fresh all day. The advanced formula includes Cucumber and Aloe Vera Extracts to help soothe and refresh skin while Hyaluronic Acid, known to bind moisture, helps to soften, tone and rehydrate skin. A powerhouse of Peony Leaf, Juniper Berry and Phoenix Leaf Stem Cells reinforces the skin barrier and provides antioxidant protection. Set, restore and protect with confidence knowing Coola's 70% + organic formula has you covered! Perfect for adding extra SPF on the go! I keep this in my beach bag and add a spritz or 2 when I feel like I need to reapply sunscreen, and this does the trick without needing to rub lotion on top of my foundation! I tried this product last summer as I wanted a quick, easy way to reapply sunscreen without disturbing my makeup underneath. I usually only wear blush and powdered foundation on my skin. This was convenient and I had no problem spraying it on my face. I closed my eyes & pulled my lips in and sprayed with my arm all the way away from my face. My only gripes with this product are the heavy price tag and the terrible packaging. The plastic is very cheap and the lid cracked within the first week. I would recommend putting it into a plastic baggy or individual travel pouch so it doesnâ€™t leak. Also, wipe down / clean the nozzle regularly so it doesnâ€™t clog. This helps keep the spray a finer mist and not big splats. I will definitely repurchase for this spring / summer as an easy to-go sunscreen top-up. I agree with the other reviewer that I was deceived in thinking that I could spray this product on my face to top up my SPF protection during the day, especially when travelling, but it must be sprayed on to the hands and then applied to the face. Big disappointment. The product also contains chemical sun blockers, which I do not use because they are questionable when it comes to safety. I always choose a mineral sunscreen, but decided to give this a try because, again, I thought I could spray it on my face and not disturb my makeup. Then I read that some chemical sunscreens can be a lung irritant, so I was thrilled with that news. GAAA! Sun protection is an absolute must, but a pain in the neck! Really enjoyed this product in terms of it applying SPF to my face without disturbing my makeup. Really great formula that mattifies and dries instantly! My only gripe was the fact that because there is alcohol in it, you have to make sure you close your eyes and tick your lips in! disappointing and deceiving. i bought this "makeup setting spray" with the intent to set my makeup and be able to reapply mid day for sun protection but the directions says "Do not spray onto face. Spray onto hands and apply before sun exposure" WHAT? $51.00CDN for a product that should not be sprayed onto the face? i wanted an SPF that i could apply without disturbing my makeup. just spray my face anyway? well i did first thing the spray nozzle gets clogged up after being used a few times so prepare to be SPIT on. also the film that it leaves on your clothing, EW! i do LOVE the sunscreen/coconut ish after smell. i say after smell cause at first your its like someone is misting (or spitting) alcohol onto your face.. makes me cough and stings and stinks!! makes sense because alcohol is the first inactive ingredient on the list. I am truly disappointed in this product i had high hopes i wanted it to be great! would not recommend. What a fresh new product. I was looking for a finishing spray with an SPF and came across this lovely item. It is very light and fresh. I will keep this as a long term staple in my daily make up routine. This is the best. Apply sunscreen without worrying about your makeup. Love it!